There are many showings on the 20,000 plus acres good until 2022. There's a copper porphyry identical to Copper Mountain. A gold anomaly, and a skarn with a crater beside it. These basically make a line to Copper Mountain through a rift between the two mountains. A mag 1km by 0.5kms shows a huge Craigmont style deposit on the skarn. 700 meters of trenching showed 1 to 13% Copper. 1500m of drilling showed 15m of 0.5% copper. Beside Copper Mountain, Princeton, British Columbia,Canada. 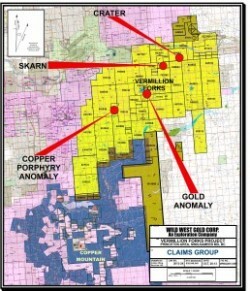 Wild West Gold Corp. is exploring a large property SE of Princeton, BC called the Vermillion which has a variety of copper deposits and three stand alone major exploration projects in this well endowed and infrastructure rich area. The focus so far has been on the "Main Zone" which is a clone of the Craigmont Copper mine near Merritt and similar to the Whitehorse Copper Mines in the Yukon. Craigmont produced 36.75 million tons of ore grading 1.28% copper. These two mines were the most profitable skarn copper mines in North America. Initial work completed on the main zone consists of geophysics, trenching and diamond drilling which has confirmed its importance. At Craigmont is was not until the 5th drill hole that 540 feet of 2% copper was cut and not until the 15th hole that 640 feet of 4.4% copper was encountered. The favourable zone is in the same middle section of the Nicola Group rocks as Craigmont and geophysics shows the anomaly to extend over 300 metres distance to the south. A second important area of exploration is southwest of August Lake where previous Induced polarization surveys showed the Copper Mountain Mine type of copper porphyry mineralization, discovered on Knob Hill surface exposures, extends southerly in an overburden covered area. WWG will do a more modern Induced Polarization survey before starting a trenching and diamond drilling program. Ore from this zone could be either sold to the Copper Mountain mill or concentrated and shipped to a smelter. The original Copper Farm mineralization was ore bearing veins alongside the pink dykes that cut both the intrusive and Nicola rocks. During exploration of that area a new variety of copper mineralization was discovered that is associated with two separate volcanic necks for the Nicola Group lavas where skarn copper mineralization is associated with a mineralized intrusive. This is an important new type of previously unrecognized copper deposit. WWG will extend the mapping and excavator trenching, then complete an Induced polarization survey to guide the diamond drill program. These three mineralized areas can be considered stand alone deposits. In addition there are many less developed mineralization targets throughout this large property. Southeast of August Lake a soil geochemistry gold anomaly was reported that is north of a recently identified epithermal gold alteration zone outcrop. 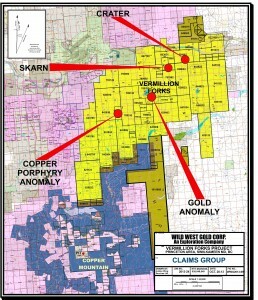 Epithermal gold zones are new to the Princeton area and will be explored by WWG. There are over a dozen copper bearing showings ranging from flow top mineralization of basalt flows to simple veins in Nicola rocks or skarns separate from the above ones that bear further evaluation to see if major exploration should be done on them.